In addition to our other overhead traveling cranes and jib cranes, Uesco manufactures and installs monorail crane systems. A monorail crane is effective when materials are being transported within a facility repeatedly from one point to another without the need of additional lateral motion. The monorail hoist and trolley travel along a single beam. Unlike bridge cranes and gantry cranes, a monorail system remains fixed in one area. It’s a cost effective solution to workplaces where materials only need to travel across a room or worksite along only two axes – up and down (hook movement) or back and forth (hoist and trolley). They can be mounted either on runway systems, or they can be suspended from ceilings. They may serve as an alternative method of transporting materials to conveyor belts. While some runway systems simply feature a single straight beam, they can be created in a variety of different configurations, able to include curves, different heights, and multiple hoists. Furthermore, they can be manually powered with chain or lever hoists and manual trolleys, or they can be operated using electrical power and either unpowered hoist types, electric chain hoists, or air chain hoists. A monorial crane system may be an excellent choice for applications where small and confined areas may be present where traditional forklifts, lift trucks, conveyor belts, or other overhead crane systems would prove to be too bulky or impractical. Another benefit to a monorail system over conveyor belts is that the materials handling system does not take up any valuable floor space and leaves the location free of any blockages on the floor level. 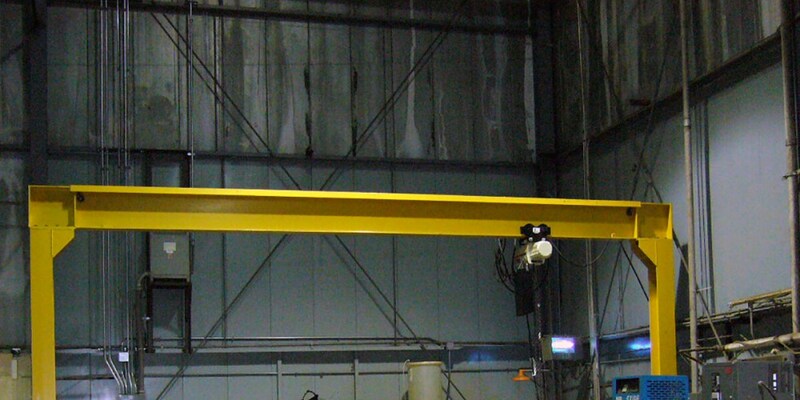 Click the button below to request a quote or to inquire about our engineered monorail crane systems. One of our overhead material handling specialists will respond to your request for information quickly.